Decades ago the international hair research community discovered that hair around the scalp is genetically programmed to grow throughout life. This was the foundation for a permanent solution to hair loss: a transplantation at Moser Medical. Moser Medical is a leading European hair grafting provider and a pioneer in the field. It's important to know the following when considering a hair transplant: hair roots naturally grow in clumps of 1, 2, 3, or 4. These groups are referred to as Follicular Units (FUs). 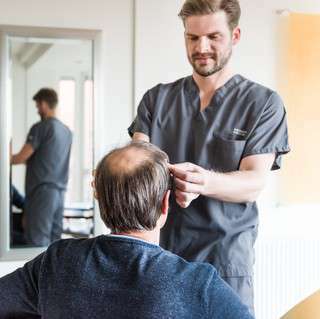 FUs from the back of the head are programmed for lifelong growth and so can be extracted and grafted onto bald or thinning areas where they will grow and cultivate new hair. A thorough and individual consultation is very important to us. At your first appointment, the medical specialist will precisely analyse your hair situation, determine your suitability for a transplant, discuss your wishes for your hair, and recommend a solution best suited for your personal hair situation. This consultation lasts about one hour and is possible at seven different Moser Medical locations throughout Austria. As we are absolutely confident about the services we provide, this first consultation is free and completely nonbinding. On the morning of your treatment you will be greeted by our friendly service personnel at the Vienna clinic. In this calm and peaceful atmosphere they will discuss the day’s procedure with you, as well as your follow up treatment over the weeks to come. Before the transplantation takes place there is a comprehensive discussion with the doctor, during which you will make a decision regarding your optimal hairline. During the entire treatment you will be accompanied by your personal medical assistant, who will prioritise your comfort and assist you in any way possible. You can sleep, listen to your favourite music on an iPod, or you are welcome to chat with our medical team. You are welcome to have a snack, a drink, or to use the bathroom at any time. To begin with, hair roots are extracted from the donation region of the hair crown. Depending on the technique, hair follicles are extracted singularly (FUE) or in small groupings (FUT). The length of the extraction is essential in deciding between the two techniques. Next, our assistant teams - made up of up to 15 specialists - use high-resolution microscopes to prepare and organise the extracted roots into their natural groupings. During this time, the doctor prepares your transplantation area with tiny incisions. Finally, the prepared FUs are planted into all of the previously defined bald or thin areas, taking into account your natural direction of hair growth. Thanks to our particularly fine precision instruments, we make sure that even during the incision process we take into account growth direction and crown structure. This is how we are able to achieve especially thick hair. What should you expect after the transplantation? You will go home on the same day of the treatment with a thin bandage over the front of your scalp. We will gladly provide you with a cap to go over it. Furthermore you will receive our BioRegeneration solution, which was specifically developed by the Moser Development Team for improved hair growth during the first few days after a procedure. You will spray this nutrient solution onto your scalp hourly on the first and second day after the procedure. Three to five days later, your transplant will no longer be noticeable and you will be once again fit for your private and professional day-to-day life. After two weeks you can resume your sports activities. After that, simply wait patiently for the transplanted hair to begin growing. You can once again style your hair as you like it! We look forward to greeting you again at our Moser Clinic in Vienna during the course of a voluntary follow-up appointment. 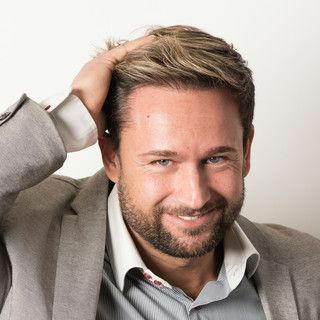 If I had realised sooner how simple and uncomplicated a hair transplant is, I would have come to Moser Medical years earlier. The treatment has definitely enriched my life! With this new extraction technique, donor hair is taken out of a single elliptical strip of hair from the donation region on the back of your head. That’s why FUT (Follicular Unit Transplantation) is often referred to as the Strip Technique. The actual transplantation of your donor hair in the FUT Technique is identical to the FUE Technique. In this technique, hair follicles are taken individually from the donation region. We at Moser Medical are the first in Austria to use the innovative Hybrid-Rotations-Oscillations-Instrument (HyRO), which ensures a particularly gentle, high-quality treatment. 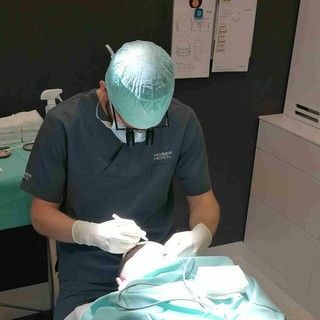 This extraction technique ensures the highest possible rates of growth, but it requires us to trim the hair on the back of your head to 1mm. Die PRP-Haartherapie bewirkt durch Eigenblut-Plasma, das gezielt auf durch Haarausfall gefährdete Stellen des Kopfes injiziert wird, eine Neubildung von Haarfollikeln. Dies reduziert oder stoppt den Haarausfall. Eine PRP-Therapie ist zwar keine Lösung für kahle Stellen oder Glatzen (daher auch kein Ersatz für eine Eigenhaartransplantation), aber in vielen Fällen bewirken bereits einzelne Behandlungen, dass das Haar merkbar dichter und kräftiger wächst. Hier mehr erfahren über die PRP-Therapie. We exclusively perform procedures that will meet all of our criteria for a successful, high-quality, long-lasting hair transplant. Our decades of experience have truly been worth it, as they have resulted in tens of thousands of successful hair transplantations. This is the “Gold Standard” up to which all hair transplants worldwide are held. Moser Medical is a member of the largest and most active international organisation for hair surgery, the (International Society of Hair Restoration Surgery). This non-profit organisation was founded in 1992 and works toward constantly improving the quality of continuing education for hair surgery professionals. Moser Medical isn’t merely a passive member of the ISHRS. We actively participate in conferences in order to exchange experiences with the world’s leading specialists. Our highly specialised doctors and assistants regularly attend these conferences, both to give presentations and for their own continuing professional education. During our consultation discussion, we will discuss the best possible extraction method based on your individual hair situation and your wishes. Experience: Hair Transplantation specialist since 1979. Quality: Only at Moser can you be sure of being always a step ahead but not merely following the latest trend. We are future oriented: our experience helps us picture how our patients will look in 10, 20, or more years. Quantity: Up to 4,500 FUs in just one treatment. Growth guarantee: We guarantee that at least 93% of the transplanted hair will grow. Top-quality performance: Leading, internationally- recognised doctors, and an 18-person team of experienced assistants. Recognised: Recognised with the Oscar of hair surgery, the Platinum Follicle Award, as well as many additional honours. You empower our work as an industry leader in hair transplants. Top Hygiene: Top hygiene: the state-licensed private clinic in Vienna fulfills the highest European standards and the AKH Standard. Moser Medical regularly undergoes official inspections.